A solitary deer captured in the morning mist on a university campus. The seams of a petrochemical tank seeming to look like creases in paper. Snow falling on a used car lot off Washington Avenue. 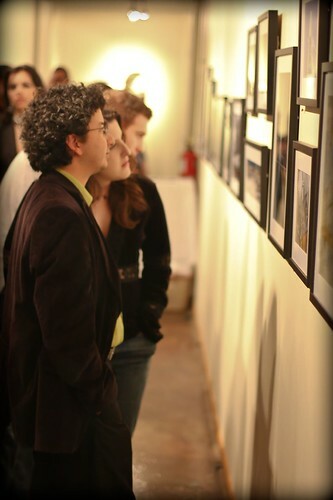 These photos and more were on display this past Friday night at Xniliho Gallery as Houstonist, the local offshoot of blog collective Gothamist, hosted its second 600 sq mi juried photo exhibition reception. Photographers from around the city -- amateur or professional -- were invited to submit their best work which most accurately fit this year's 600 sq mi theme: hidden. Madeline Yale of the Houston Center for Photography served as this year's jury, which resulted in 45 photographers and 60 photos chosen for the show. While the big opening bash was Friday night, you can still catch the show every day at Xniliho Gallery until November 23. We recommend grabbing a cup of coffee at the adjoining coffeehouse (Taft St. Coffee) and spending some time getting acquainted with the hidden side of Houston. In the meantime, check out some of our favorite photos from the reception below. For more information about the photos, including the photographer, simply click on them.